The Smart Magnetic Door Sensor activates when the magnetic stripe is Separated. The Receiver will Alert and Notice you with a ringtone when the door/window is opened. Works perfect on welcome customers and stores/office/nursery/home Security. Step 1:Press the " forward " / " backward " button on the receiver to choose your favorite melody. Step 2:Press and hold down the volume button ,until it makes a "Ding" sound and the receiver indicator flashes. Step 3:Separate the sensor quickly,it will makes a "Ding-Ding" sound and the receiver indicator flashes. Step 4:Separate the sensor again to confirm whether the current ringtone is the one you have set,if yes,the pairing is completed. Step 1:Press and hold down the volume button on the receiver until it makes a "Ding" sound and the receiver indicator flashes. Step 2:Separate the sensor quickly,it will makes a "Ding-Ding" sound and the receiver indicator flashes. Step 3:Separate the sensor again to confirm whether the receiver can sound,if yes,the pairing is completed. If the receiver can not work when you receive it,please pair it to the sensors. The installation gap between 2 parts of the magnetic sensors should be less than 0.4 inch. Receiver has 55 Ring Tones for your Choice.Operating Range is 500+ Feet in open Area .5 Levels Adjustable Volume From 0db to 110db.Also have Night Light Feature. The Night Light can be Switch On or Off Freedom. Easy Use ( Plug and Play ) ,just Plug the receiver into the Electrical Outlet. The door/window open sensor fixed with Double-sided Adhesive Tape. The receiver is Expandable to work with 55pcs of Sensors/Transmitters at Most .Also each Sensor/Transmitter can work with multiple receivers. 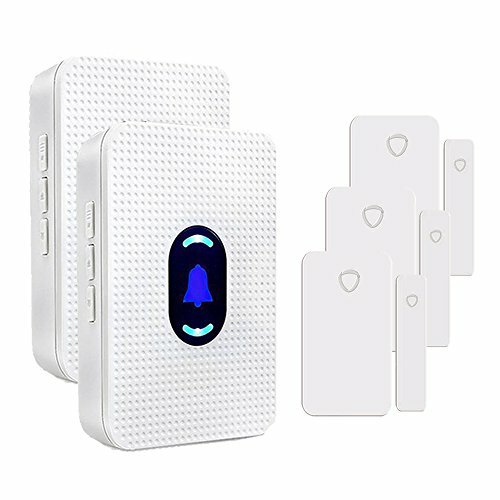 2 Receivers can be placed in different places(like base floor ,second floor, Bedroom, kitchen etc), 3 door open sensors can be set in Entrance , windows, garage and so forth. If you have any questions about this product by Daytech, contact us by completing and submitting the form below. If you are looking for a specif part number, please include it with your message.